Get ready for an 80s injection! CLUB TROPICANA THE MUSICAL is heading to a theatre near you! The World Premier of this new Jukebox musical begins touring in January 2018, ready to bring a taste of Summer to our Winter months...Hair was big, shoulders were padded and mobile phones were shaped like bricks and weighed a tonne! Tickets are now on sale for the UK tour of CLUB TROPICANA THE MUSICAL. 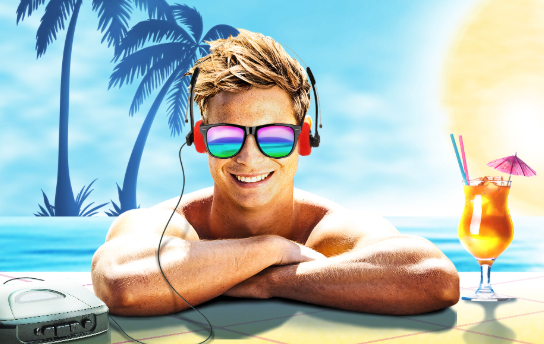 Take a fun-packed trip back in time to the electric 80’s with the world premiere of CLUB TROPICANA THE MUSICAL, a summer adventure of love in the sun, with a soundtrack of smash-hit pop classics - it really is the feel-good musical of the year! When our budding bride and groom get cold feet, they decide to jet off separately to sunnier climes and feel the heat – but little do they know they’ve checked into the same hotel… the vibrant Club Tropicana! With drinks flowing and tans glowing, will our young lovers decide to finally go through with the wedding? Will hotel inspectors get their way and close the resort, or will the staff save the day? All will be revealed in hilarious style, to an irresistible soundtrack of some of the most iconic, chart-topping pop anthems of the decade all performed live on stage, including: The Look of Love (made famous by ABC), Bucks Fizz’s Making Your Mind Up, Frankie Goes to Hollywood’s 1983 debut hit, Relax, Tight Fit’s Fantasy Island, a-ha’s Take On Me, Culture Club’s Church of the Poison Mind, Up Where We Belong, made famous by Joe Cocker and Jennifer Warnes, and many, many more! Welcome to Club Tropicana, the 1980’s answer to Love Island. The drinks are free and the whole family are invited to join the ultimate holiday musical, celebrating everything we loved about the 80’s, a decade when girls (and boys) just wanted to have fun. Club Tropicana The Musical will open a major UK tour at the Churchill Theatre Bromley (Thursday 24 January - Saturday 2 February 2019) and then visit Bradford Alhambra; His Majesty’s Theatre, Aberdeen; Norwich Theatre Royal; Sheffield Lyceum Theatre; Plymouth Theatre Royal; Grand Opera House, York; Theatre Royal, Brighton; New Victoria Theatre, Woking; Cheltenham Everyman Theatre; Hull New Theatre; Wimbledon New Theatre; Wolverhampton Grand Theatre; Coventry Belgrade Theatre; Oxford New Theatre; Sunderland Empire Theatre; Swansea Grand Theatre; Manchester Opera House; Edinburgh Playhouse; Marlowe Theatre, Canterbury; Liverpool Empire; Nottingham Theatre Royal, with more dates to be announced.